A local fabricating company known for its unique artistic metal design. Melissa and Brandon Ruff operate Firemass Metal Co., a local fabricating company known for its unique artistic metal design. 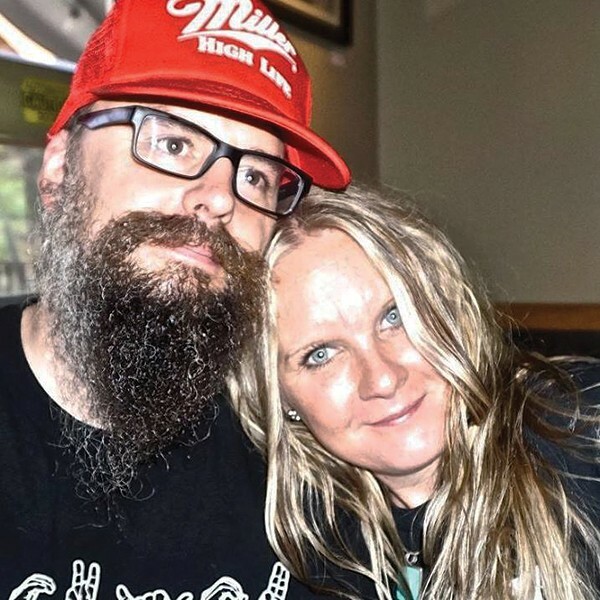 Melissa, the company's business manager, recounts that husband Brandon was a pro-snowboarder for 16 years. During the offseason, he became obsessed with classic cars and would mess around with welding. 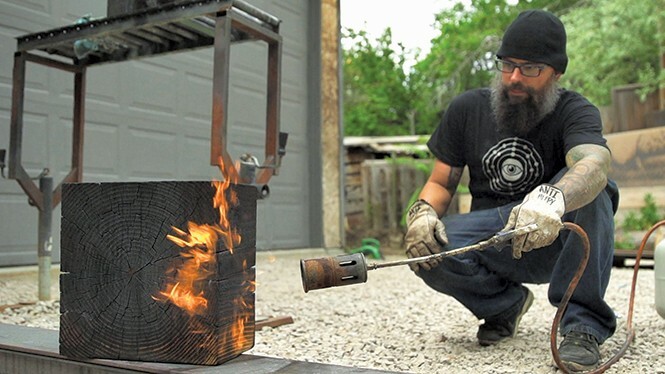 This downtime hobby gave way to Brandon leaving pro-snowboarding and the couple embarking on a new venture that recently received acclaim for its "man caves" and was featured on the Discovery Channel show, Epic Man Cave Builds. What type of projects do you typically do? I don't identify Firemass as typical. We build anything from basic railings to a vintage bar constructed from an actual 1956 Cruisers Inc. boat with a custom blender made from the boat's two-stroke motor. We've built a wraparound bar made out of genuine whiskey staves and steel. It's crazy, but we try to utilize everything from pieces we salvage. Brandon's brain is not typical. He'll take a client's idea and tweak it into something they never imagined. The most recent local project we did was the university location of the new Porcupine Pub & Grille, which opened in November 2015. All the metal work is ours. How did you end up being featured on a show about man caves? It's ironic because Brandon's humility doesn't allow him to invite, or enjoy, a lot of attention. But they found us: A production company emailed Brandon out of the blue asking if we'd be interested in being a part of a TV project. Apparently, they had been cyber-stalking us for months and loved our unique work and ideas. It literally happened overnight. 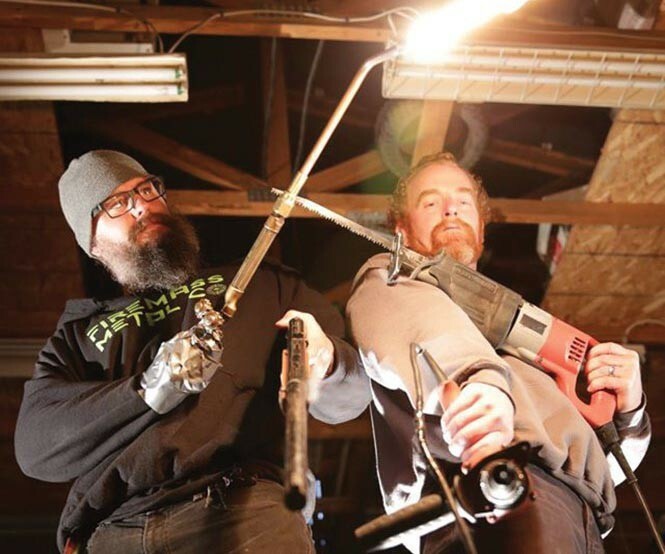 Our show is titled Epic Man Cave Builds and premiered on Discovery Channel in June 2015. They show re-runs of the program periodically, and we are in the midst of negotiating contracts for renewal. What's the most notable or outrageous man-cave projects you were involved in? It was a project for an Army veteran in Chicago looking for a military-themed space. We wanted to go nuts to show him our gratitude for what he had sacrificed for our country. He had a number of guns and asked that we come up with a storage system to allow him to safely store his guns. Rather than building an ordinary locking gun safe, we came up with the idea to camouflage his gun storage. We custom built the entire arsenal and shelving out of steel; we machined the locking mechanisms and handles; and we used a motorized hydraulic system to submerge the arsenal into the ceiling, completely out of sight. It turned out to be pretty badass, and he was stoked!